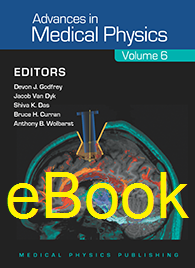 MPP’s biennial review of the treatments and techniques on the cutting edge of medical imaging and treatment, Advances in Medical Physics is designed to help medical physicists and technically inclined physicians stay current in medical radiation science and technology — especially in subfields of medical physics other than their own. Volume 6 is full of exciting new advances. There are fifteen chapters by the world’s leading authorities as selected by editors you know and trust. Topics include: photoacoustic imaging, high-intensity focused ultrasound, radiation exposure on a trip to Mars, and recent advances in brachytherapy.